If you are about to pick cherries either directly from a tree, or from a local orchard or market, here's what you need to know to pick the best cherries. Cherries are a fairly early crop, flowering soon after the last frosts in April and May, setting fruit sin June in most areas (but check your area's harvest calendar and call the farm or orchard you are planning to go to a few weeks ahead). Cherries, like peaches, continue to increase in size until they are ripe. They should be picked when they are of maximum size and full-flavored. 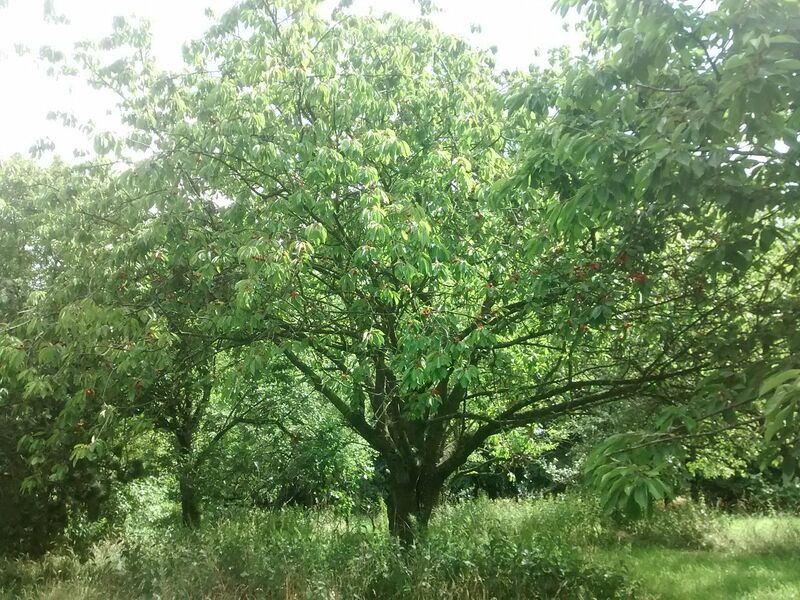 Cherries picked before they are fully mature will not ripen off the tree. Sweet cherries become firm when ripe (the stems usually stay attached when you pick a sweet cherry), and sour cherries part easily from the stem. Look for heavy, firm cherries with a shiny skin and fresh stem. If it is ripe, it will easily come off in your hand, with the stem attached. Repeat these operations using both hands until each holds 3 or 4 cherries. Don't overfill your containers or try to pack the cherries down. Pick only the cherries that are fully red (or whatever color they are supposed to be when ripe!). Part the leaves with your hands to look for hidden cherries ready for harvest. Avoid placing the picked cherries in the sunshine any longer than necessary. It is better to put them in the shade of a tree or shed than in the car trunk or on the car seat. Cool them as soon as possible after picking. Cherries may be kept fresh in the refrigerator for two or three days, depending upon the initial quality of the berry. Always call before you go to the farm - Cherries are affected by weather (especially rain and cooler temperatures) more than most crops. And when they are in season, a large turnout can pick a field clean before noon, so CALL first!Always call before you go to the farm - Cherries are affected by weather (especially rain and cooler temperatures) more than most crops. And when they are in season, a large turnout can pick a field clean before noon, so CALL first! Most growers furnish picking containers designed for Cherries, but they may charge you for them; be sure to call before you go to see if you need to bring containers. If you use your own containers, remember that heaping Cherries more than 3 inches deep will smush the lower cherries. Plastic dishpans, metal oven pans with 3 inch tall sides and large pots make good containers. I like the Glad storage containers like the one at right. DON'T wash the cherries until you are ready to use them. Washing makes them more prone to spoiling. Cherries are more perishable than blueberries or strawberries, so make a point of refrigerating them as immediately as possible after purchase. Temperatures between 34 F and 38 F are best, but, be careful not to freeze cherries! (Fresh cherries are highly prone to freeze damage). Even under ideal conditions cherries will only keep for a few days in a refrigerator, so for best flavor and texture, consume or freeze them as soon as possible after purchase. Bing cherries are deep red in color and sweet. Blackgold - very late mid-season. Good for eating fresh. Self-fertile. Emperor Francis are White or Blush Sweet Cherries, Early season, perfect for canning, making jellies and jams, or making homemade maraschinos. Hedelfingen is a later season sweet cherry. It has large, black fruit. Kristin cherries are a a mid-season cherry developed in New York. Lambert Cherry is a large, black, late harves cherry of very good quality, compared to Bing. 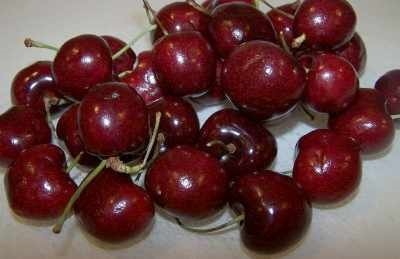 Lapins Cherry is a self-fruitful, karge, dark red sweet cherry from Canada with firm, good flavor. Ripens a few days after Bing and needs only 400 chilling hours or less to produce fruit. Rainier cherries are golden yellow with a pink or red blush. Ranier cherries are large and sweet. Sam - early ripening, large, black sweet cherry. Ripens 11 days after Vista. Skeena cherries are a late ripening variety. Thesy are dark red,firm and juicy. Somerset cherries are medium sized, later season cherries that are dark and firm. Sonata - Very large, black, and moderately sweet fruit. Self-fertile. Staccato cherries are a deep purple-red and also a late season variety. Staccato cherries are large and one of the sweetest varieties. Sunburst - large, firm fruit. Old productive variety. Self-fertile. Symphony - bright red, medium-sweet very large fruit. Late season. Self-fertile. Tehranivee - mid-season cherry developed in Ontario, Canada. Cracking can be a problem. Self-fertile. Ulster - medium-sized, firm, dark cherry, Ripens about 2 days after Vista. Vandalay - Large, red fruit with an unusual kidney shape. From Canada. Self-fertile. Viscount - medium-large, firm, good, dark red cherries. Late season ripening. Vista - the cherries are very dark, almost black. Large excellent-quality fruit.Mid season, ripens around the last week in June. Viva - dark red, 3/4 inch fruit from Canada. Ripens around July 4. White Gold are a blush cherry of moderate to large size. Danube Erdi Botermo has dark red fruit with a unique sweet-tart flavor. Delicious eaten fresh or in baked goods. Ripens about 1 week before Montmorency. Dark-juice-tarts has juice that is red rather than clear in color. Jubileum - new, from Hungary. Very large with a dark red flesh. Sweet for a tart cherry, not quite as tart as Montmorency. Meteor - Medium-sized fruit with an odd shaped pit. Ripen s3 to 7 days after Northstar. Montmorency, the most co,mmonly grown, traditional cherry for pies, baking and canning. Ripens around the last week of June to the first week of July. Northstar - Medium-sized, dark red fruit. Surefire - A new late blooming variety from Cornell. Bright red, medium sized fruit. Cherries come in many colors besides red: there are also dark red (almost black), yellow, blush (mixed) and gold cherries. Cherries are a very healthy food; they are high Vitamin C and naturally have no fat, cholesterol or sodium. They are also a good source of ivitamin A, calcium, protein, and iron. Cherries are an antioxidant-rich foods. One cup of cherries is less than 90 calories and 3 grams of fiber. One cup of cherries has 260 mg of potassium which plays a key role in muscle, heart, kidney, and nerve cell functions. Cherries are high in fiber. Half to one pound of cherry fruit per day can provide twenty to thirty grams of fiber which is adequate for an adult daily nutrition requirement. Do the math and be careful not to over-purchase as Cherries quickly mold when left at room temperature, and only last a couple of days in the refrigerator. Most sweet cherry trees are usually not self-pollinating, so you will at least two or three trees so that they can pollinate each other. There are a few relatively new self-pollinating varieties, like the dwarf Stella tree. Other self-fertile cherry varieties are Lapins, Starkrimson, and Sunburst. and a few others (see the list above) Sweet cherries usually require a high number of cold chilling hours, meaning they require a long cold winter. Generally, sweet cherry trees will not reliably produce a crop in the Deep South and other climates withmild winters. Sour cherries, typically will produce a crop in warmer climates. But even sour cherries won't produce in Florida and similar climates. . Sour cherries are usually too tart to be eaten fresh, but are fine in pies, preserves and other cooking uses. Sour cherries are typically much smaller than sweet cherries. All varieties of sour cherries are self-fertile, so you can plant only one tree, if you wish. Both types of cherries will produce a beautiful show of flowers in the Spring, for which cherry trees are famous. And even if it is too warm for them to produce a crop of fruit, they will still produce the flowers. Cherry trees are sold in both dwarf and standard sizes (based on the rootstock to which they are grafted. Standard-size trees will start bearing fruit i4 years after planting and can produce 30 to 50 quarts of cherries per year. It is generally best to plant cherries in late fall or early winter to give them time to get established. You will need netting over the trees as the cherries ripes; birds will attack them and eat them voraciously otherwise! Just like with apples, you can prune the trees to almost any shape, typically a fan or espanier, sdo they can fit in any space. They do like full sun. As raw fruit, sweet cherries provide little nutrient content per 100 g serving (nutrient table). Dietary fiber and vitamin C are present in moderate content while other vitamins and dietary minerals each supply less than 10% of the Daily Value (DV) per serving, respectively (table). Compared to sweet cherries, raw sour cherries contain slightly higher content per 100 g of vitamin C (12% DV) and vitamin A (8% DV) (table). Questions and Answers and other tips!s! I want to make cherry juice and cherry jam. Do you know how I could extract the juice, getting rid of the pits? There are various tpyes of cherry pitters that are easy and effective. Juicers tend to jam on the pits (if you know of a brand of juicer that is reliable and effective with cherries, write me!